As a new or existing business, it’s so important to carry out regular SEO audits on your website(s). Not only does it improve the chances of your web pages being seen by your target audience, but it also allows you to keep up-to-date with the latest regulations and changes that the search engines impose on us. If you have a website that has quite a lot of pages and blog posts, it may take you a lot longer to carry out and, for that reason, I recommend using a professional digital marketing agency to do this for you. I only suggest this as it allows you to spend time on running and marketing your business, whilst leaving the technical changes to your website to the professionals. If you haven’t done so already, ensure your website has a sitemap. This sitemap will need to be submitted to Google and Bing webmaster tools. Did you know that there could be several versions of your website out there? In essence, this means there are several different ways for people to type in your web address. Ordinarily, this isn’t a problem but, if this is the case, you will need to address this. To find this out, all you need to do is type the HTTP version into the address bar and see which version it redirects to. 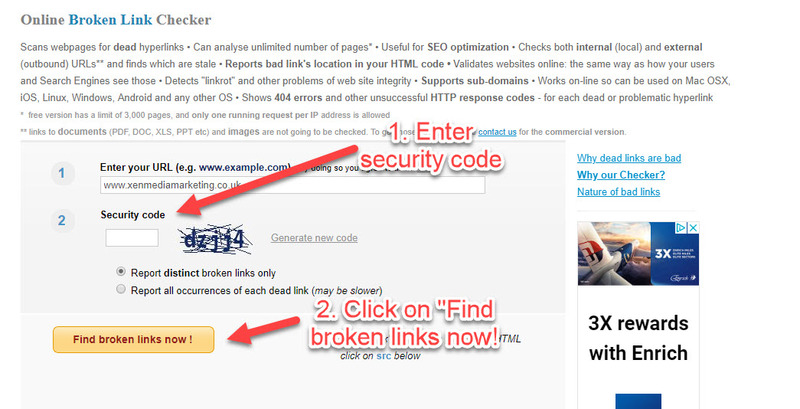 To carry out at 301 redirects, use the instructions here. Alternatively, get in touch with us and we can do this for you. Where possible, try to use an https:// address, whether you’re using it with a www or non-www. This is because a website that is security protected and enabled, at the moment, performs slightly better in the search results. It sounds quite technical, doesn’t it? Don’t worry, it’s not as technical as it sounds – to mimic a website crawl in the same way that Google does, you can use a free tool called Beam Us Up. There are other more comprehensive tools out there but, to do a basic SEO audit, Beam Us Up is pretty much all you need for now. It allows you to find specific SEO errors really easily by letting you filter, sort and segment the data from the results it finds. It also allows you to export that data into a csv/excel file. It finds duplicate pages on your website (believe it or not, this is a very common problem) and it also displays them in such a way so you know how to fix them. Note: This is a desktop tool and not an online one. The simplest way to do this is using the Google search bar. Type into the search bar – site:yourwebsiteurl. Obviously, replacing the “yourwebsiteurl” with the URL of your website (don’t insert to the http: or www, though). By doing this, it will allow you to see how many pages have been indexed by Google. To be honest, this is quite a crude way of doing it and I would recommend using Google Search Console, which is far more accurate. As you can see from the image above, Google has indexed a few XenMedia pages. If you don’t see any pages listed, you’ve got big problems. In essence, this means that Google has not indexed any of your pages and so will not be sending you any organic traffic at all. There could be several different reasons for this and a lot of times, it’s to do with the content headers on your website and the fact that the robots either aren’t allowed to or can’t read the content. To find out more, you will need to access your websites header.php, .htaccess or the server file. This article explains everything you need to know about this. 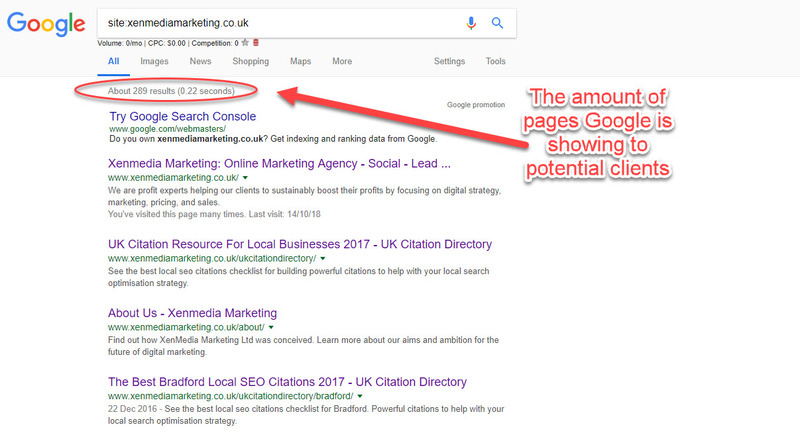 As I mentioned earlier, some of these things will be too complicated for you to sort out and because of the importance of having your website called and indexed properly, I suggest you get a professional to look into this pronto. I only suggest that you carry out this part of the audit if your website is new and hasn’t been set up for that long. There’s really no need to do this if you have an established brand that’s been around for a few years. The odds are, you should hold number one ranking for your brand name unless it is a generic one. To find this out, go ahead and do a search for your brand name in Google. It should be position number one. 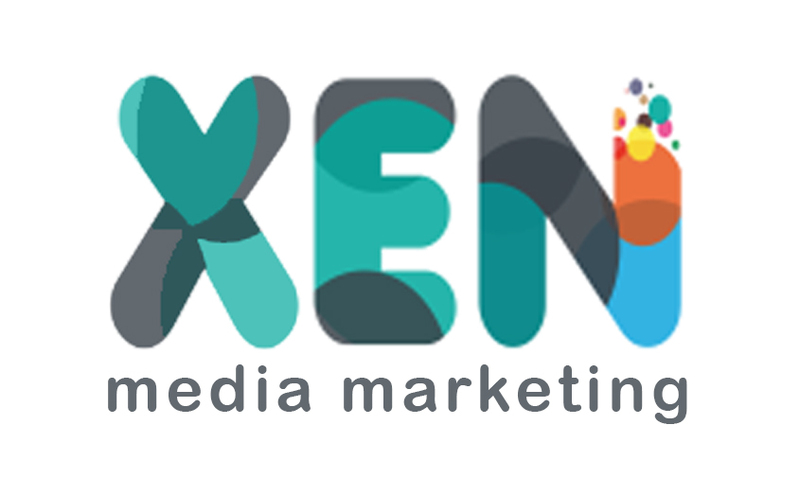 At Xenmedia, we work with a lot of new businesses and companies and oftentimes, they don’t rank for their brand name. The very first thing we get them to do, if they haven’t done so already, is to register with Google Business or (Google Places). With any luck, their business is already listed – they just need to claim it. However, on the odd occasion, it’s not really listed and we just need to register it as a new business. The key here is to fill out your business profile completely and, where possible, include as many images, videos and, most important of all, start receiving reviews from customers and clients. You can also fix the branding problem by partaking in extensive brand and link-building. The fastest way of doing this is to start running PR campaigns, writing guest blog posts for other websites in your niche (ensuring there’s a link back to your website), registering with local business directories, building citations and making sure you register your business with all the social networks. Now, even though you register your business with all the social networks, it really doesn’t mean that you have to use them all. I would suggest making a few posts on each of them and ensuring that your profile is fully complete. By doing this, you’re sending some really strong signals to the search engines that this is indeed your brand. Do all the things that I’ve just mentioned and you should certainly start climbing up the search engine rankings until you reach number one for your brand name. Like I said earlier, ranking for your brand name isn’t really that difficult and you shouldn’t find this a problem. Google has stated that the very first 3 to 5 words of your URL are the most important and it gives it the most weight – therefore, the idea here is to ensure the URL as short as possible. This particular part of the audit isn’t really going to be that popular, because some people have very large websites with very long URLs. Unfortunately, if you want your website to perform well in the search engines (especially Google), you’re going to need to abide by the rules and make the relevant changes accordingly….Sorry! You may not realise this, but the title tag on your pages and posts are the most important on-page SEO factor. This doesn’t mean that you need to start every title off with your keyword, however, I would recommend placing a few towards the front of your title as possible. Especially if it’s a really hard keyword you’re trying to rank for. What are modifiers, I hear you ask? Since most of the keywords you’re targeting will be long-tail keywords and are generally not found in the keyword tool, the idea is to add certain modifiers to increase the chances of your article or post been found. So, you can add things like the year, “2018”, “review”, “guide”, “best”, “latest”, or “new” – these words are called modifiers and will help your articles to be found because those words are extremely popular words typed into the search engines every single day. Using header tags in the right context is the best way to structure content on a page and it notifies the search engines as to the content that is important on that page. There are several h tags you can use, but the proper ones are h1, h2, h3 and h4. By structuring your content in this way; not only is this great for text-based search engine results, but it’s also fantastic for your content being picked up by voice search engines. New voice search technology use headers to categorise certain topics (especially if that header is asking a question followed by an answer). That’s why it’s a good idea to get into the habit of using headers in your content. There are certain tools like Yoast that will recommend you put it in the first paragraph and that’s OK, but research has found that including the keyword in the first 100 words is just as effective and it means that you’re not trying to spam the search engines by having your content structured in the exact same way. If you ensure that your website is responsive (re-sized depending on the device it is being viewed on), it means that the experience that your consumers have should be the same across all platforms. Oh, and the search engines demand this…! In fact, Google actually started penalising websites that weren’t mobile-friendly back in 2015. If your website isn’t mobile-responsive, you can simply change the website to a Wordpress platform, where the vast majority of themes are mobile-responsive by default. When you write your content, always ensure that you link to an external source – this is particularly good if you have a word that is difficult to explain and another website (preferably an authority website like Wikipedia) can explain this in a better way. Internal links; similar to outbound links but with the main difference of linking to internal pages and posts rather than an external website. Not only is this good SEO practice, but it also allows you to showcase content (particularly old content) that otherwise wouldn’t have been seen before. Google has stated on multiple occasions that they take the loading speed of your page into account. This means it’s never been quite so important to make sure that your pages load quickly. You can test how fast your pages load by using this tool. The GTMetrix.com tool checks your site loading speed and provides you with useful recommendations on how to optimise it. As you may or may not be aware, Google isn’t a great fan of duplicate content. If your site has a lot of duplicate content at the moment, for example, using the same content on pages for different areas that you cover, we would recommend that you make each page unique. Technically, Google doesn’t really penalise you for this and you won’t necessarily get a strike against your website – what Google will probably do is not show several versions of the same content in the search results. The idea is to make crawling and ranking your pages as easy as possible for the search engines. The easier you make it for them to crawl your website, the more pages they are likely to rank, as well as the other factors in this audit. If you’ve had content written for you or you’ve asked a member of staff to write a piece of content for your website, you can easily find out if the content that was written has been copied from another page by using a service called Copyscape. Simply enter the URL of the page that you want to check and Copyscape will show you any duplicate results. Note: checking one page is fine, but if you need to check your whole website, you would need to subscribe to the premium service that Copyscape offer. One of the best ways of fixing a duplicate content problem is to set up a 301 redirect from the duplicate page to the correct page. Not only is this best practice, but it also allows you to concentrate all of your efforts on building links to the one page that’s relevant instead of many. Having high quality, relevant and popular pages by way of backlinks means that more of your pages on your website will rank really well. You can find out how to do a redirect from here. If you use Wordpress, there are several plugins available for you to install to carry out this function. Another option of correcting duplicate content issues is to use the rel=canonical attribute. In essence, what you’re doing is physically telling the search engines which page is the original and which ones are pretty much a copy of the original. We do this a lot when we write guest posts for our clients or we use third-party platforms like Medium to distribute our content to a much wider audience. The last option is using the meta tags “no index” and “no follow”. By adding these meta tags (normally found at the top of a page or post in the html code), you’re telling the search engines to exclude this page or post from the search engine index. If you use Wordpress for your website, you can do this without knowing any code at all by installing a plug-in. The two plugins I would recommend are Yoast and All In One SEO Pack. Of course, there are several others you can choose from but these two are the most popular. A lot of people forget that images make up quite a big part of your on-page SEO. Search engines absolutely love them because they convey so much information to the reader, when formatted and published correctly. To help improve your image optimisation, you need to provide the search engines with some image metadata. Even though search engines like Google are quite sophisticated and are able to recognise what some images are, it’s not perfect and still needs a helping hand to accurately categorise the images on your page. The two most important elements of an image are the filename and the alt description (sometimes called an alt tag). All these elements should include a clear description of the image and, better still if it includes the keywords that you’re targeting. You should also parse keywords correctly – this means not having any single keyword image descriptions, use hyphens instead of underscores or plus signs, etc. Using structured data allows Google to crawl your websites a lot better and, where it’s easy for a human to understand the context of a page, it’s not always easy for a machine – this means you not only have to format content so that humans can read/ understand it, you also need to add structured data that allows the machines to read the content on your page with more accuracy. Find out how well your site is structured by using Google’s Structured Data Testing Tool. Don’t worry, even if you have a large website, it doesn’t take this tool very long to work out if or where your website has errors. If you find that you have errors after running this test and it would be our recommendation to fix these as quickly as possible, you can either hire someone to do this for you or take a look at this guide to give you an idea of how to fix it yourself. No matter what size your website is, I bet you’ve taken a lot of time and effort to try and make it as good as possible. However, one thing that can let you down are broken links on your website. 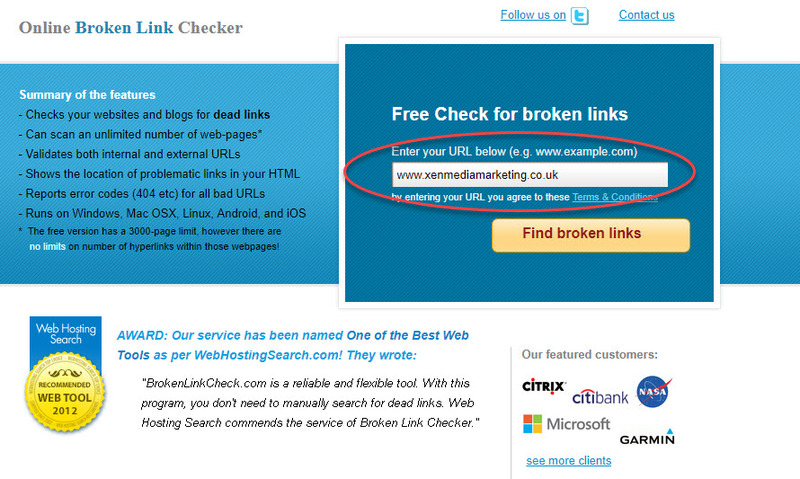 As you can imagine, it’s extremely annoying for your clients to click on your links only to find them not working. To be fair, unless you check for these, your clients will never let you know which, in turn, means you can’t fix something if you don’t know it’s a problem. Broken links cause two distinct problems; the first is a really bad user experience for your client and as I’m sure you can appreciate that if they have a bad experience, they’re less likely to convert. The next problem is search engines scoring web pages based on user experience. If the amount of time somebody spends on your website is very low and there’s very little engagement (i.e. clicking on links), the search engines won’t rank your pages as high as they should be. So, to avoid this problem, we recommend periodically checking your site for broken links. Again, this is not as hard as it sounds – all you need to do is use an online link checker which alerts you to any broken links, 404 errors and websites that timeout (which usually means they have been deleted from a server). Once you find out which links are broken, it’s simply a case of going through each line systematically and fixing those problems. This can range from deleting a link on a page or post to going to the root domain of a page to find out if there’s an alternative link (sometimes they change the URL address). 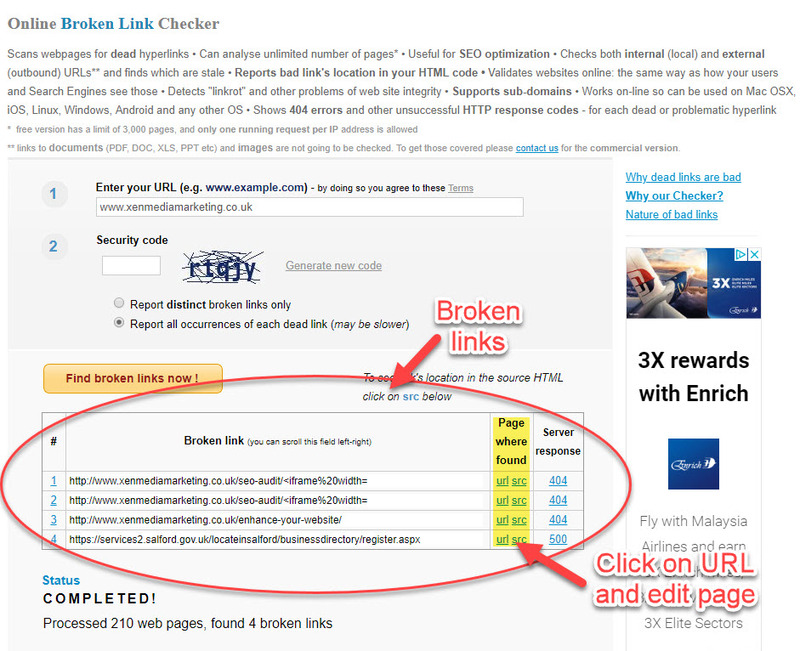 There are various other ways and tools you can use to find broken links but we find the online link checker to be the fastest and easiest to use. 5. Click on the URL link > Navigate and edit page to either change or remove link. There are many businesses that perform an SEO audit regularly but very few perform a full content audit. The reason for that is, very few businesses think of content marketing as being that important and so don’t see the need to carry out an audit when there’s not that much content to carry on audit out on. Delete that page or post entirely. Admittedly, the second option is rather drastic but sometimes culling pages and posts from your website is the best thing you can do. Don’t forget, search engines like Google or Bing are looking for the best pages and posts possible to show to their audience and your website has the possibility of being one of the chosen few that are consistently ranking well in the top 3 spots of the search engine results pages (SERPS). The higher quality your pages and posts, the more traffic you’ll receive from the search engines. That’s why it’s a good idea to consistently audit your content. Using Google Analytics, you should be able to find out which pages and posts generate the most traffic and which ones don’t. Here’s a great article that shows you exactly how to do this. As I’ve mentioned previously, it’s a well-proven fact that long-form content performs better in search engines. Long-form content is categorised as anything that is over 1000 words in length. Therefore, it’s a good idea to go back through all of your pages and posts and see if there is any content where you can increase the total word count by adding extra paragraphs or even extra information. If you’re using Wordpress for your website, the editor shows you how many words you have used at the bottom. However, if you are not using Wordpress and don’t have access to the behind the scenes dashboard of your website, then you can use a tool – Web Page Word Counter to find out exactly how many words you have used on a page or post.